Beef, Whole Ground Salmon, Beef Heart, Beef Liver, Turkey, Beef Bone, Turkey Liver, Calcium Carbonate, Pumpkin Seed, Potassium chloride, Organic Cranberries, Organic Spinach, Organic Broccoli, Organic Beets, Sodium Phosphate Monobasic, Organic Carrots, Organic Squash, Organic Apples, Organic Blueberries, Choline Chloride, Dried Pediococcus acidilactici Fermentation Product, Dried Lactobacillus acidophilus Fermentation Product, Dried Bifidobacterium Iongum Fermentation Product, Dried Enterococcus faecium Fermentation Product, Taurine, Natural Tocopherols (preservative), Zinc Proteinate, Zinc Sulfate, Iron Sulfate, Iron Proteinate, Vitamin E Supplement, Niacin, Copper Sulfate, Copper Proteinate, Manganese Sulfate, Sodium Selenite, Manganese Proteinate, Thiamine Monohydrate, Pyridoxine Hydrochloride, Vitamin D3 Supplement, Calcium Iodate, Vitamin B12 Supplement. 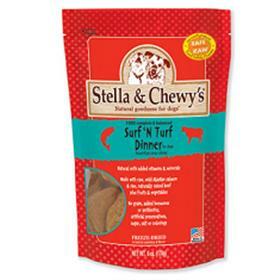 My dogs are on a raw diet and I'll get these freeze-dried patties for in-between meal snacks. Perfectly sized for large dogs. Super healthy. Tasty. Grain-free.